We understand that our primary mission is service to our customers. They make it possible to grow and prosper. It is our goal to be recognized as the leading provider of quality limousine service in our region. We believe that attaining this position is a continuing journey in search of excellence. We provide a commitment to excellence by accepting only the very best efforts by our drivers and staff. You will be impressed by Abby Limousine's consistent level of superior service. Give Abby the opportunity to meet and exceed your expectations! 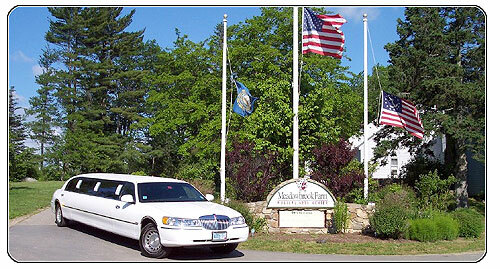 Abby Limousine Service LLC is one of the very best Plymouth area limo and airport car services in the entire state, and one uniquely located to serve Lakes Region, White Mountains, and Upper Valley. We pride ourselves on quality service and making customers happy for their special event. Whether it’s prom night, a wedding, airport shuttle, a night on the town, sporting events, a concert, or any other event, Abby Limousine Service LLC can make it an enjoyable and pain-free experience. It’s our job to make you happy from the minute we pick you up. We pride ourselves in our growing list of satisfied customers who continue to trust us to service their limousine rental needs. Those who’ve needed a trusted wedding limo, prom limousine, an airport taxi, or a limousine rental for any other service rely on Abby Limousine Service LLC to get the job done right. Happy customers are the way we stay in business, and that’s why we keep your needs #1. If you choose Abby Limousine Service LLC you will be working with professionals. All limousines and drivers are fully licensed and insured, and we’re a proud member of The National Limousine Association. Our services for prom, wedding, and other event services are second to none. For weddings, our custom limousines pick you up from your home and onto the reception in luxury, so you don’t have to worry about anything. It is one of those most important days of your life, so don’t settle for second best. Let us spoil you with quality service for this important day. From your prom to other special days, Abby Limousine Service LLC can help too! It’s the perfect night to hire a professional limousine service to make you stand out in the crowd. We treat you like VIPs, offering custom lighting and sound systems to make sure you enjoy yourself. While sports night may seem like a more normal night than proms or weddings, getting together with friends and family for a good game is priceless. We can take you all over, from Fenway Park to Gilette Stadium. It’s the perfect escape. So if you’re looking for the right ground transportation service for a special event, choose the very best. Abby Limousine Service LLC makes it simple and easy to have fun at any event. For your most important days like weddings and proms, leave nothing to chance. Impress your friends and loved ones. Show them you’re ready for a good time!